Public Health Dietician Laura Needham (left) and Jill Umbach, Planning Network Coordinator with Bruce Grey Poverty Task Force, discussed food security issues with Saugeen Shores councillors at their July 24 meeting. Councillors were asked to consider endorsing a Bruce Grey Food Charter to create a just, sustainable and secure food system. SAU – The statistic that 14 to 17 per cent of children under 19 in Saugeen Shores live in poverty struck a chord with some Saugeen Shores councillors who were briefed on the work of the Food Security Action Group – part of the Bruce Grey Poverty Task Force – at a July 24 town committee meeting. For the past four years the Grey Bruce Poverty Task Force – politicians, 51 social agencies and community-based partners – have examined the root causes of poverty and identified barriers to change. One of the main issues is food security – having reliable access to a sufficient quantity of affordable, appropriate and nutritious food – supported by a Food Charter that values health, social justice, culture, education, sustainable economic development and the environment. “Rather than looking at a charitable situation all the time… we want those people to actually access other systems – whether it is connecting with fresh produce from a farmer that’s got excess, or whether its connecting to community gardens that are good for mental health but [where they] also can access fresh food….” Umbach said. Food banks are still needed for crisis back-up, but Umbach said low-income people need better access to food that involves them more in the food system, including community gardens and school snack programs. Coun. Mike Myatt said the 17 per cent poverty rate for those under-19 in Grey Bruce “struck a chord” and asked the source of the statistic and if the number was broken down further to give a Saugeen shores number. Umbach said it was Census Canada data estimating that in Saugeen Shores, the average rate would be 14 to 17 per cent because the economy is stronger in Bruce than in Grey County. After the meeting Umbach said the 17 per cent figure represents the number of people under 19 in a family of four with annual income less than $42,000. Coun. Neil Menage asked if people could legally give away surplus food – he’d had to compost an over-abundant crop of grapes. Umbach said it is “totally acceptable” noting there are Second Harvest programs and they are all noted on a food asset map. Menage also suggested they could develop community gardens in local passive parks. Saugeen Shores Coun. Dave Myette thanked Umbach and Needham for “planting the seeds” to develop food security, and said he’d bring a motion to endorse the Food Charter at the future town council meeting. 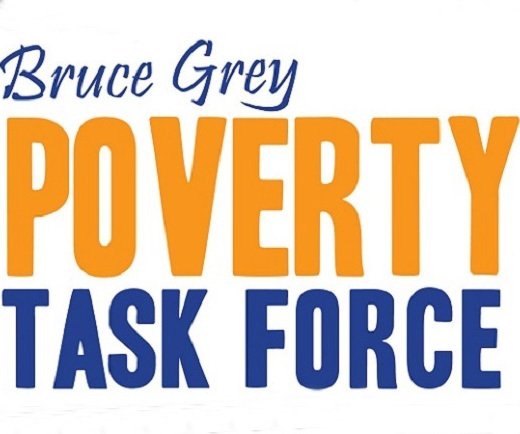 Umbach said the first Grey Bruce Poverty Task Force, Bridges Out of Poverty program – Getting Ahead – holds its first sessions in Port Elgin, starting on August 14 at the Community Housing Centre. The program offers people receiving Ontario Works or Ontario Disability Support Program benefits, an eight-week program that looks at generational and situational poverty and looks at the resources available for low-income people in the community to deal with housing, transportation and social issues. Anyone interested should contact their worker for a referral. She said some of the graduates of the Port Elgin Bridges Out of Poverty program would be invited to speak to Saugeen Shores Council at a future date about their experiences. OWEN SOUND – The numbers are in and they show it costs $775.37 a month to feed a family of four in Grey-Bruce – up 3.7% from last year – according to figures released by the Grey Bruce Health Unit Thursday. The annual Ontario Nutritious Food Basket survey measures regional costs of basic healthy food and calculates the minimum cost for individuals and families to eat properly. Grey Bruce Public Health dietitian Laura Needham said local health units went shopping for basic food items in Grey and Bruce counties. They bought the least expensive items available. “Unfortunately, income has not increased at the same rate, so individuals and families are forced to use more of their income just to meet basic needs,” according to a news release from public health and the Bruce Grey Poverty Task Force, which announced the results. People on social assistance can be spending 38% of their monthly income on food. “This is not possible after paying for rent, utilities and other necessary expenses,” poverty task force chair Jill Umbach said in the release. The average Ontario family would spend 11% on food, she said. Ways to help impoverished people who can’t afford sufficient nutritious food will be discussed by the Bruce Grey Poverty Task Force Friday, Dec. 13. Everyone interested in the issue is invited to attend the discussion at St. Andrew’s Church in Owen Sound, 865 2nd Ave. W., between 10 a.m. and noon. Needham said she thinks food costs presented in the study could be conservative because they assume people know how to be smart shoppers, can recognize healthy foods and know how to cook them. Otherwise, costs would climb if shoppers bought prepared meals. The $775.37 monthly food cost assumes a family of four consists of a man and woman between ages 31 and 50, a boy 14 to 18 years and a girl four to eight years of age. Task force, which is holding an open house next Friday to draw on ideas from the public, will deal with the broader question of food security, which includes food costs, income, housing, education, transportation and food skills like those Needham referred to. Task force membership includes county, church, social service agencies, police and grassroots groups helping people who are poor. Needham co-chairs the food security committee on the task force. Other committees are looking at housing and transportation separately. Needham’s committee is going to produce a “food charter” to outline an action plan. It will get people with a stake in food security to commit to doing certain things to alleviate the problem. The Friday discussion will consider what could be done. Needham acknowledged part of the solution will require more involvement from upper levels of government. Other possible parts to the solution could include “food hubs,” which are centres for food security activities, she said.